This story represents solely the perspectives of the author. Photos were provided by NHCAW. Dr. David Burdick explains how the Cutts Cove living shoreline project was designed and constructed. Photo by Kirsten Howard. 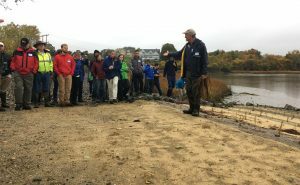 On October 26, I attended the Engineering Living Shorelines in Tidal NH Workshop, held in Portsmouth and sponsored by the NH DES Coastal Program, the Great Bay National Estuarine Research Reserve, UNH, NOAA and others. It was well attended by over 50 people from New Hampshire and the neighboring coastal states. 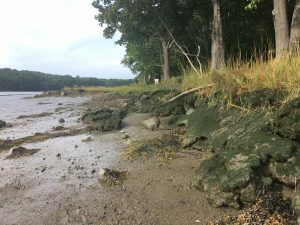 The concept is that we have lost much of our living tidal shorelines to development and what can be done to keep what is left and maybe restore some. Interestingly, development is just not putting rip-rap or a wall to hold a beach or filling the tidal marsh to build a house. We are talking death by a thousand cuts. Like dams along rivers that restrict the movement of restoring sediment out into the bays. Like tide gates that choke off the tidal flows into estuarine marshes. Like erosion from wave action that tears apart shorelines, marches the tidal flows into upland areas, and that may threaten houses. Like water quality degradation that kills of beds of eel grass or edges of marsh vegetation, which leaves areas virtually denuded, on the way of becoming mud flats. And the big one, the rise of coastal waters that will drown out the marshes before they have time to adapt. The workshop focused not on a depressing litany of causes, but rather on how to restore some of the past damage. However, this is very much a process in its infancy. The workshop went into the fine details of two public projects. One was in the harbor, where the establishment of a tidal marsh was taking place where there had been a rip-rap slope. The other was in the bay, where wave action was tearing apart a shoreline. We did not see photos of successful marsh restoration at these, because there were none. These projects were just starting, with initial work done and fingers crossed. A tremendous amount of effort and planning went into these projects. We hope they work. Not because these are massive projects that will change and reverse the continued degradation, but for what will be learned. Erosion at the Wagon Hill Farm living shoreline project site in Durham. Photo by Kirsten Howard. 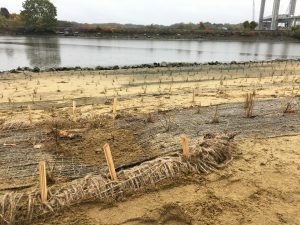 Why bother to attempt establishment of living shorelines? Why bother to restore areas along the coast or in Great Bay? After all, the rip-rap and walls have been protecting our uplands just fine. You think so, huh? So why do we keeping pouring money into strengthening this wall or dumping more and larger stone to keep that house from falling into the water? Hard protection may have its place, but soft solutions have the potential to last longer with less maintenance. Why do I call the creation of living shorelines a soft solution? The concept is that something that extends out from the upland at a shallow angle, that is living and repairing itself, and ties itself together with roots and stems, has a better chance of weathering a storm than a hard surface that is pounded by the waves. A marsh will dissipate storm surge and wave action in the first 30 feet of its edge. Pretty darn impressive. So, what is holding us back from a real push to save our precious upland from the attack of ocean or bay waves and storms? This brings us back to the public projects. We need to know how to make this work in our environment. This kind of work has been ongoing along the southern Atlantic coastline for years. But they have a number of big advantages: their tidal fluctuation is 3 feet as opposed to our 8 feet, they have a long growing season as opposed to our short season and, on top of that, we have ice that rips apart newly planted areas like tidal marsh restoration projects. 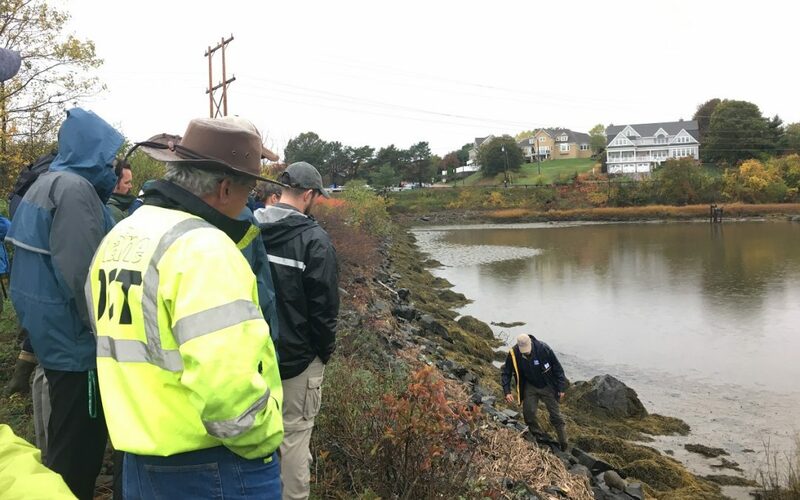 Sill construction below mean high water at the Cutts Cove living shoreline site in Portsmouth. The value of the public projects is to create a cookbook. No, I don’t mean Fifty Different Ways to Add Salt Marsh Hay into Your Salads. What I do mean is How to Build a Living Marsh That Has a Better Than Even Chance of Long-term Survival. Not the catchiest title, and it won’t top the best seller list of the NY Times, but it might be the most read book by consultants, contractors, regulators and others trying to keep our tiny bit of coastline and a not so tiny bay from eroding out beneath our feet. Speaking of regulations, here big changes need to be considered. The State has adopted the position that once it is gone, it is gone. I am speaking of eroding shorelines, whether coastal or inland. If the banks erode away and the water’s edge is moved upland, the eroded land has quite literally fallen into the ownership of the State. So, any attempt to restore the eroded bank with a soft, living shoreline, has the effect of taking still more upland away from the land owner. To make restoration of living shorelines work, we need more of a carrot than a stick. The stick is always there. You want to fix this with a wall or rock, so you can only work in the area above the water’s edge, and lose more upland. Jute material staked to control runoff above newly planted marsh grasses at the Cutts Cove project site. Photo by Kirsten Howard. The carrot however, would be the concept of giving back your original upland edge if you choose creation of a living shoreline. 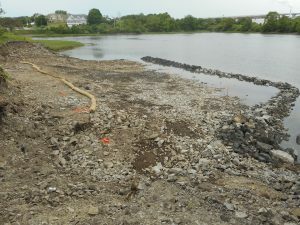 In other words, the State would allow the water’s edge to be returned to its original location prior to erosion, to allow space for the soft solution to be installed. The carrot for the land owner is that they “get back” the land they lost and have a chance of keeping that land without having to repair a rock slope after every large storm. Regardless of what your preference is for administrations, the fact is that the climate is changing. The result of that change is wider swings from the norm. It means that winters will be colder, that summers will be longer and the storms will be more powerful. Unfortunately, we ain’t seen nuthin’ yet! We need to seriously consider changes to our approaches to eroding banks, whether coastal or inland. We need to consider actions and policies that are outside of the norm, because the norm is not working. Past “In My View” articles will be stored on the GES Inc. website at www.gesinc.biz or Google: Gove Environmental Services, Inc. I hope this will be of value to you. If you are interested in signing up for the “In My View” opinion article published monthly, please contact Jim Gove using the information provided below. Jim Gove | Gove Environmental Services, Inc.